Irn-Bru maker AG Barr shrugged off the sugar tax and other challenges last year to post a rise in sales. Revenue grew by 5.6% to £279m at the Cumbernauld-based soft drinks firm, whose brands include Rubicon, Tizer and Strathmore. The company saw pre-tax profit fall slightly to £44.5m for the year to 26 January, after taking a one-off pension service charge. Stripping out exceptional items, profits were up 2.5%, at £45.2m. Barr said the results were "all the more pleasing" given the UK government's Soft Drinks Industry Levy (SDIL), which was introduced last April. It also had to contend with carbon dioxide shortages during the summer heatwave, the Beast from the East snow disruption, and a number of business failures. 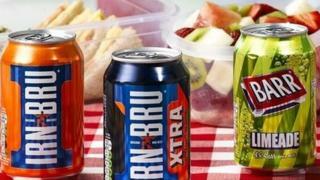 The firm revamped Irn-Bru and other drinks ranges to reduce their sugar content ahead of the launch of the soft drinks sugar tax. Irn-Bru sugar-free variants now account for 40% of the total brand. Image caption Chief executive Roger White said the company was "fit for purpose and resilient"
Barr said revenue from its carbonates business increased by 8.9%, driven primarily by Irn-Bru, the Barr flavours range and Rubicon Spring. However, its Rockstar energy drink experienced a decline in sales after years of sustained growth. Barr attributed the performance to "intense promotional pressure" and new product launches by competitor brands. Barr also saw an overall decline in its stills and water segment, with volume down 6% and revenue down 7%. The company said Rubicon fruit drinks faced "significant competitive challenges in a declining market segment" while its Strathmore still water range was "impacted by competitive pricing across the market". Chief executive Roger White said: "I am pleased to report we have delivered another strong financial performance, having adapted well to both the circumstances we anticipated and those which were less expected." He added that, while uncertainty across the UK economy was likely to prevail for the "foreseeable future", the company was "fit for purpose and resilient".